Haruna Nagashima has had no luck in love. A tomboy who played softball in junior high, as soon as she entered high school Haruna set her sights on getting a boyfriend. Unsuccessful, Haruna enlists help from Yoh Komiyama, a popular senior to be her dating coach! Yoh finds girls and dating to be a pain, and he is standoffish at first to Haruna. He only agrees to help Haruna on one condition: she can’t fall in love with him. 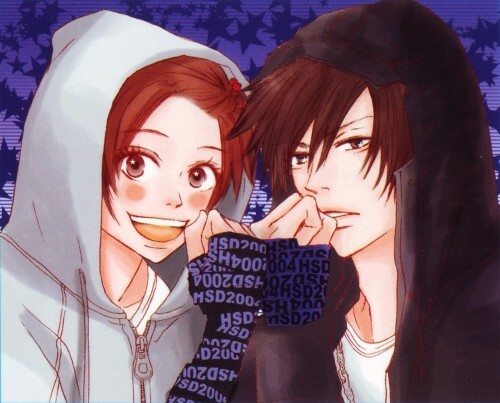 Along the way, Haruna becomes friends with Yoh’s group, including his sister Asami and his best friends Asaoka and Fumi. 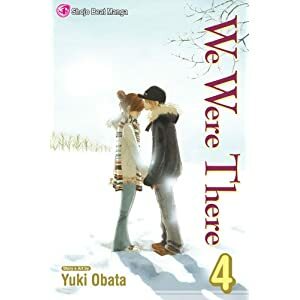 At first, Haruna falls for Fumi (who is kind but clueless), but when he starts going out with Asami, Haruna gets over him and starts to have feelings for Yoh (of course). Yoh quickly figures out Haruna has feelings for someone, but despite his innate ability to read her like a book, he is unable to tell that the person she has feelings for is himself. When he starts to realize it may be him, he asks her and she denies it, out of fear of losing Yoh as her coach. Yoh realizes he’s disappointed with her answer, but Haruna quickly changes her mind and decides to tell him she loves him, and by volume three, the two have started dating. Even though I expected the two of them to get together, I had a bit of a problem with Yoh changing his mind so quickly about the possiblity of Haruna having feelings for him, particularly since he had been so adamant about her not falling for him. This is especially because very little had been done to show that Yoh actually has feelings for Haruna too. It seemed as though Haruna’s feelings for Yoh were stronger than his. Luckily, this problem is resolved by volume six when Yoh meets up with his ex-girlfriend, who still loves him. He tells her that he doesn’t care for her anymore and he could never break up with Haruna because “everytime she’s worried about him, she’s not dressed warm enough.” While his ex-girlfriend often only cared about her own feelings, Haruna always takes Yoh into consideration, usually to the point of going overboard. I really liked this answer, and was finally able to pull for the couple. I have to say, it took me awhile to warm up to this series. I’ve already mentioned how the timing of when I’ve watched and read series has affected my opinions of them. I bought the first four volumes of High School Debut in 2009, at the same time I also got the first few volumes of Love*Com and Fushigi Yugi Genbu Kaiden. I didn’t care for High School Debut as much as these other series and found it be kind of average, so I gave up on it. It wasn’t until about a year later when I read B.O.D.Y that I learned what the word ‘average’ really means, and this prompted me to give High School Debut a second chance. I bought volumes five and six, and after rethinking things I really appreciated how the series sometimes twists shojo clichés, and I also like how cheerful Haruna is. I think the first scene that really endeared me to her character is right after she and Yoh start dating and she begins to be bullied. Like other shojo heroines in this predicament, she doesn’t tell her boyfriend what’s going on, and instead decides to endure it. However, when a group of girls confronts her about breaking up with Yoh because she doesn’t deserve him, she flat out says no, chooses to fight them all and wins. I know fighting girls over a guy isn’t exactly feminist, but I like my heroines spunky, so I appreciated that Haruna isn’t weak or passive. Overall, I really like High School Debut. Later volumes deal with the possiblity of a love triangle between Haruna, Yoh and Asaoka, but I felt it was handled differently than in most series because Asaoka was so teasing about his affections for Haruna since he’d constantly dangle his feelings for her in Yoh’s face then take his feelings back (while Haruna remained clueless for the most part). And while not every storyline is a winner (I really didn’t care for the part when Leona, Haruna’s former softball rival, attempts to ruin Haruna’s ‘happy’ high school experience by trying to tear her and Yoh apart), I think the characters are fun enough that I’m glad I gave this series a second chance, and I’d definitely recommend it to those looking for a good shojo romantic-comedy. 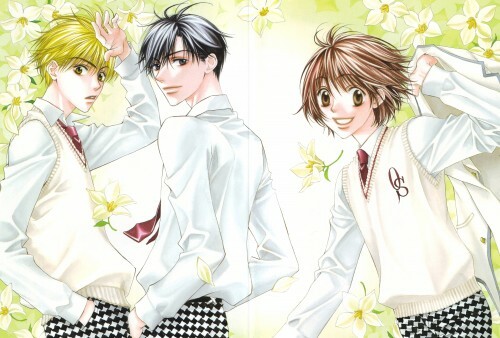 So today I’ll be reviewing Hisaya Nakajo’s 23-volume shojo series Hana-Kimi. Hana-Kimi is about Mizuki Ashiya, a Japanese-American teenage girl who admires high-jumper Izumi Sano so much she decides to move to Japan and enroll in Osaka High, a private all-boys school just to be near him! Mizuki must hide her gender from everyone at school, but with Sano as her roommate and another boy named Nakatsu in love with her that ain’t gonna be easy! One thing I appreciate about Hana-Kimi is that instead of dragging out the reveal of Mizuki’s secret, right from the beginning Sano figures it out. However, since she is unaware that Sano knows she’s a girl many hijinks ensue. Umeda, the school’s resident doctor also figures out that Mizuki is a girl (he claims he was able to tell because he’s gay), and immediately becomes Mizuki’s confidante. In addition to watching Mizuki and Sano’s romance unfold, we also get to meet the many quirky guys at the Osaka dorms along the way. Cover-to-Cover is a column where I’ll choose my favorite cover from a particular series. 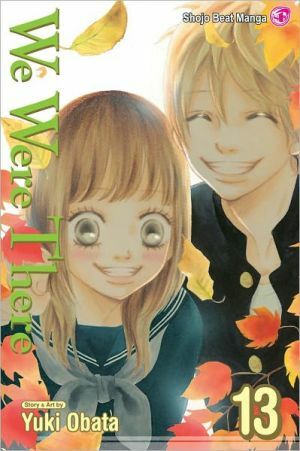 This time around I’ll be doing one of my favorite manga, We Were There. It took me awhile to get used to We Were There‘s artwork. At first, I thought it was unremarkable but didn’t care because I loved the series so much. Then upon coming across some of Yuki Obata’s lovely color pictures for the series, I began to fall in love with the manga’s art. So choosing a favorite cover for this series is a bit difficult because so many of the covers have such a joyous, dreamy feel to them. The first cover that stands out to me is volume four’s. I love that Nanami and Yano are huddled so close together in the snow; there’s a level of intimacy in this cover that is unmatched. 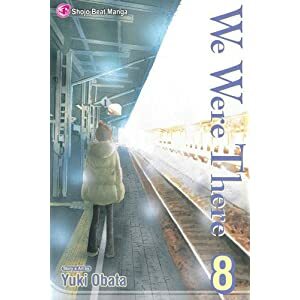 Volume eight‘s cover contains what is probably my favorite moment in the series, Nanami standing on the train platform as he heads for Tokyo with his mother. Volume 11 features the couple right before a kiss, so it definitely wins in the romantic category. 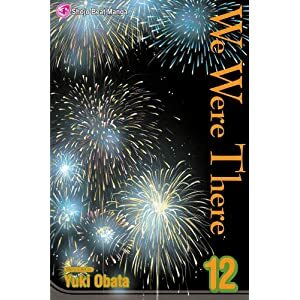 And as for the most daring cover, I’d have to say that belongs to volume 12, since it contains a simple picture of fireworks with no characters at all. But if I have to choose just one cover, I think I’ll go with volume 13. I’m sensing a theme here, because my last Cover-to-Cover pick Sand Chronicles also prominently featured beautiful autumn leaves. Nanami and Yano are adorably smiling – their smiles are almost cheesy, which I think works really well since Yano and Nanami at one point joke that they are a cheesy couple. I think this cover stands out to me because it’s brightly-colored and they just look so happy together, which is a huge contrast to the somber tone of the series at this point. Yano and Nanami see each other for the first time since he moved to Tokyo five years earlier, and he casually dismisses her (although it’s obvious he’s struggling with his feelings more than he lets on). Nanami feels as though she’s stuck at age seventeen for being unable to let go of Yano, causing her to turn down Takeuchi’s marriage proposal. Every character is suffering in some way or another, and the future seems bleak for Yano and Nanami’s relationship. 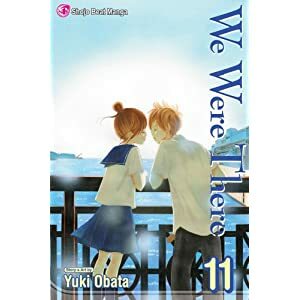 Each volume of We Were There is harder to read than the last, not only because the tone of the series is becoming sadder and sadder, but also because it’s frustrating to feel so bad for these characters who are very much unable (or unwilling) to fix their relationships. If anything, the cover of volume 13 serves as a reminder of the past; of times that will never come again – for both the characters and the audience. As an anime and manga fan, I miss 2005. The American anime industry wasn’t in the dire situation it’s in today, some of my favorite anime series were being released on DVD here, and I felt like I had many great titles to look forward to. Most of all, I miss looking forward to reading the latest issue of my favorite anime and manga magazines. Every month, I couldn’t wait for Newtype USA, Animerica and Anime Insider to be released (all of which have ended). 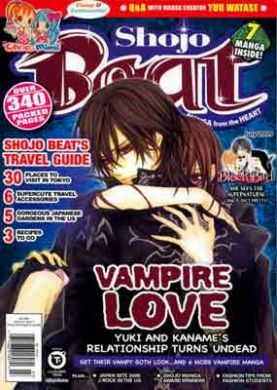 But of all of the now-defunct anime and manga magazines, I miss Shojo Beat the most. Shojo Beat got me into so many great titles I never would have given a chance. Of the manga that were serialized in the magazine, I continued reading Sand Chronicles, Nana and Honey & Clover even after the publication’s end in 2009, and it’s hard for me not to wonder what series I would currently be absorbed in had the magazine continued its run. Shojo Beat allowed me to expand my horizons and read series I would have never given a second thought. When I first saw that the magazine was running Honey & Clover, I scoffed. I knew the series was popular but didn’t know much about its plot, and was turned off by its art (which is rare for me), so I dismissed it. Yet after reading a few chapters in Shojo Beat, I found the series to be fun and hilarious, and I had a drastic change of heart towards the series. 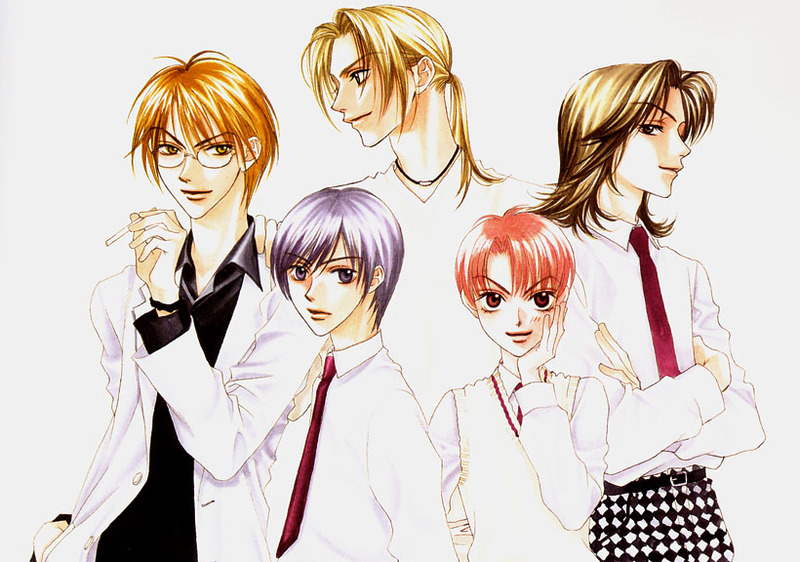 Several of my favorite manga were series I was introduced to through Shojo Beat’s previews, such as Love*Com and We Were There. I even miss the ads the magazine ran for non-Viz series. I first learned about Itazura na Kiss from an ad DMP ran in the very last issue of Shojo Beat. The art intrigued me; I could tell it was a classic series, and when I sought out further details of the series plot and realized that its premise is similar to Marmalade Boy, I was sold. But I think the biggest problem I’ve encountered since Shojo Beat finished is that I’ve been pretty clueless about the latest shojo Viz is releasing. Most of the Viz series I’m currently collecting started in 2009 or before: Skip Beat, Kimi ni Todoke, Black Bird. I found myself making a list, cataloguing the shojo releases from the past two years with a brief summary because I kept forgetting what new titles that are out there. I got into Dengeki Daisy because I’ve read so many great reviews of it and had to see what the fuss was about, but aside from that series, most of the recently-released Viz shojo manga I thought had interesting premises received negative reviews. Shojo Beat allowed me an easy and legal way to check out the latest series and decide for myself whether they were any good, rather than relying on other people’s impressions. But even more simply, it was great having that feeling of excitement: not only because I anticipated what would happen in the next issue, but I also just loved going to the store and getting the latest issue in my hands. And I miss that. 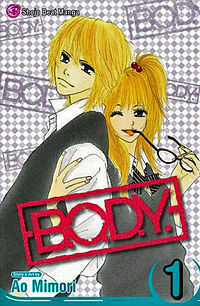 I thought I’d review B.O.D.Y, the most mediocre shojo manga I’ve ever read. The series is about Ryoko Sakura, a 16-year-old girl who has a crush on a quiet boy in her class named Ryunosuke Fuji. After a chance encounter, however, Ryoko soon discovers Ryunosuke’s not the serious student she thought he was – he works at a host club! When I read the first volume, I thought the series was sweet and had potential. I really liked the early plotline of Ryunosuke betting that he can get Ryoko to fall for him. The whole dynamic of ‘trying to get someone to fall in love with you’ was really interesting, and I thought Ryunosuke’s plan to make Ryoko unable to keep her eyes off him by avoiding her was clever. I only wish the author would have used this premise a bit longer, because by the middle of the second volume, she’s admitted her feelings for him, and they immediately start going out. And that’s when things go downhill. The next major storyline focuses on Ryunosuke trying to quit his job as a host. By pure coincidence, Ryoko meets Jin Sawamura, the president of the host club, who agrees to let Ryunosuke go if she can make one million dollars. After she fails, Ryoko tries to figure out why Jin is the way he is, against Ryunosuke’s warnings. She finds out he was once in a relationship with a woman who left him behind with her debt, causing him to get into the host club business. After Ryoko confronts the woman, Jin decides to let go of Ryunosuke for getting so embroiled in his personal affairs. And after reading all this, my immediate reaction was ‘Ugh.’ My biggest pet peeve in shojo manga is when we start focusing on side characters who have just been introduced, giving us no reason to care about them. This is especially when it’s in lieu of developing the main couple. Love*Com focused on Risa and Otani’s friends, but I was okay with that because the series waited much longer to do so, not to mention the side characters had been there from the beginning. Having these contrived plots so early on only tells me the author of B.O.D.Y, Aoi Mimori, didn’t know where the series was going. It would have been much better if the series had focused on more important questions like why Ryunosuke was working at the host club in the first place. Ridiculous plotlines aside, another irritating aspect of the series is that Ryoko continuously makes dumb decisions. It’s frustrating to see Ryoko become a hostess so Ryunosuke can quit his job, which essentially puts herself in danger, WITHOUT EVEN TELLING RYUNOSUKE about her plan. And when Ryoko is kissed by Kousuke, a host who begins dating one of Ryoko’s friends to spite her for insulting him, she doesn’t tell Ryunosuke for a really trivial reason. And even Ryoko’s friend Asuka jumps into the action, by deciding to lash out at Ryoko when she tries to stop her from taking a shady job to buy a present for Kousuke. I don’t know what message B.O.D.Y is trying to send, but ‘chicks over dicks’ isn’t one of them. Even the minor flaws in the series began to aggravate me. Aoi Mimori excessively uses flashbacks to events that happened two panels ago, as well an incredible amount of repeated dialogue and narration. And is it just me, or do B.O.D.Y’s pages seem really empty? Reading this series was jarring after coming off of Honey & Clover, which is overflowing with great dialogue. And since B.O.D.Y doesn’t even have the addictive quality of other average shojo series like Black Bird or Hot Gimmick, I’ve promptly decided to drop the series five volumes in. So every time I look at it on my bookshelf, I glare a little.